The brand-new trailer for Disney's The Lion King is available today, marking 100 days until Simba arrives in theaters on July 19. Here we get to see the best look yet as Disney brings these classic characters to life on the big screen in a way never before experienced by audiences. Disney's The Lion King, directed by Jon Favreau (The Jungle Book), journeys to the African savanna where a future king is born. Simba idolizes his father, King Mufasa, and takes to heart his own royal destiny. But not everyone in the kingdom celebrates the new cub's arrival. Scar, Mufasa's brother, and former heir to the throne, has plans of his own. The battle for Pride Rock is ravaged with betrayal, tragedy and drama, ultimately resulting in Simba's exile. With help from a curious pair of newfound friends, Simba will have to figure out how to grow up and take back what is rightfully his. Staying true to the classic story, director Jon Favreau utilizes pioneering filmmaking techniques to bring the iconic characters to the big screen in a whole new way. 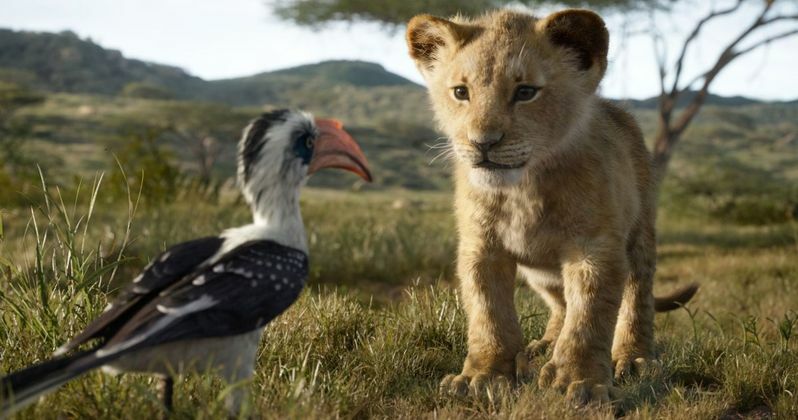 Featuring the voices of Donald Glover as Simba, Beyoncé Knowles-Carter as Nala, James Earl Jones as Mufasa, Chiwetel Ejiofor as Scar, Seth Rogen as Pumbaa and Billy Eichner as Timon, Disney's The Lion King opens in U.S. theaters on July 19, 2019. Disney's latest live-action take on an animated classic becomes a new action-adventure for the entire family to enjoy this summer, with the release date dropping square in the middle of Hollywood's biggest season.